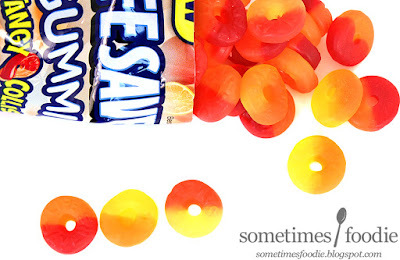 Is it gummi? Or gummy? However it's spelled, these sweets are my absolute favorites. This packaging functions well, it's just a plastic heat sealed bag, and the design is busy, but eye catching. We have a burst of radiating color, fruity images, information, and a big ol' reminder that this in a new product. The overall layout and design on the front of the bag is cohesive with the rest of the Gummi-Savers line, and I like it for what it is. However, turn the bag over and...YOLO? Really? Freaking YOLO? 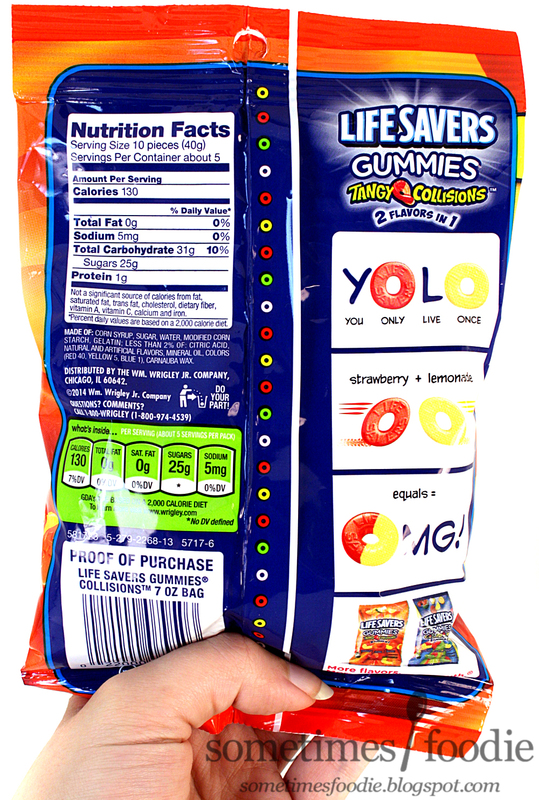 No, Lifesavers. No. Bad company. Go to the corner and think about what you did. Seriously though, YOLO? Isn't that really dated? OMG is still relevant (right? ), but YOLO? I thought that nonsense was long gone. Silly acronyms aside, the back of the packaging is really colorful and busy, so I find it a bit hard to read due to all the distractions. I feel like the company meant for the back-panel design to come off as fun and playful, but it's leaning more towards the obnoxious than anything else. Inside there are three different fruity mash-ups. As usual, tangy means citrus, so a citrus fruit is paired up with something else to make these two-toned doughnut-shapes sweet but tangy. Each combination sounds appealing, and my only reservation is that I don't know how truly "tangy" these will taste. I feel like they'll just be normal fruity gummy combinations, but let's find out! 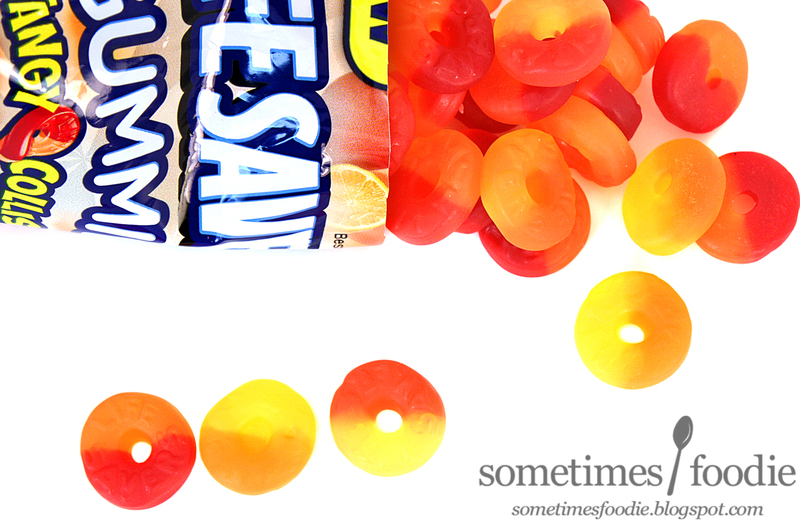 Orange & Red Apple - Instead of comparing apples to oranges, we're mashing them together. 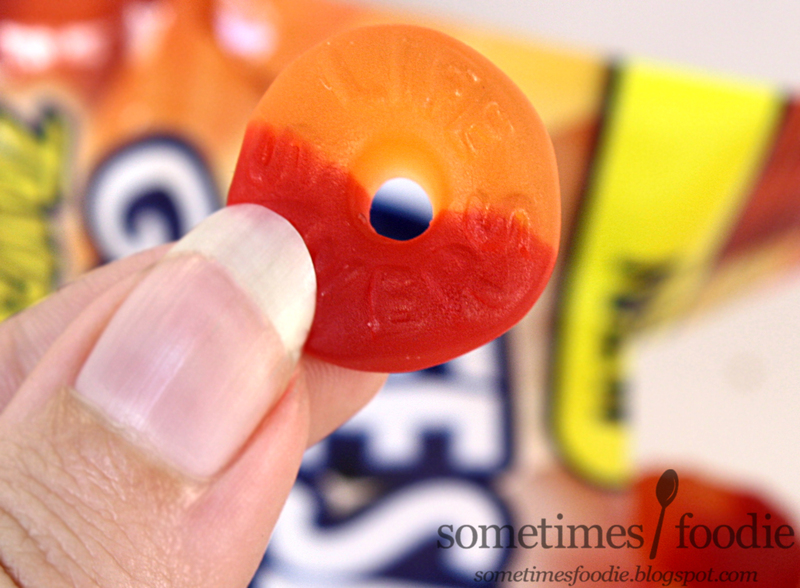 Alone, the red portion has a Snapple Apple-like flavoring, which is sweet and pretty refreshing. I know I whine apple flavoring in Skittles and other things, but if those flavors were as refreshing as this red apple, I really wouldn't mind them at all. 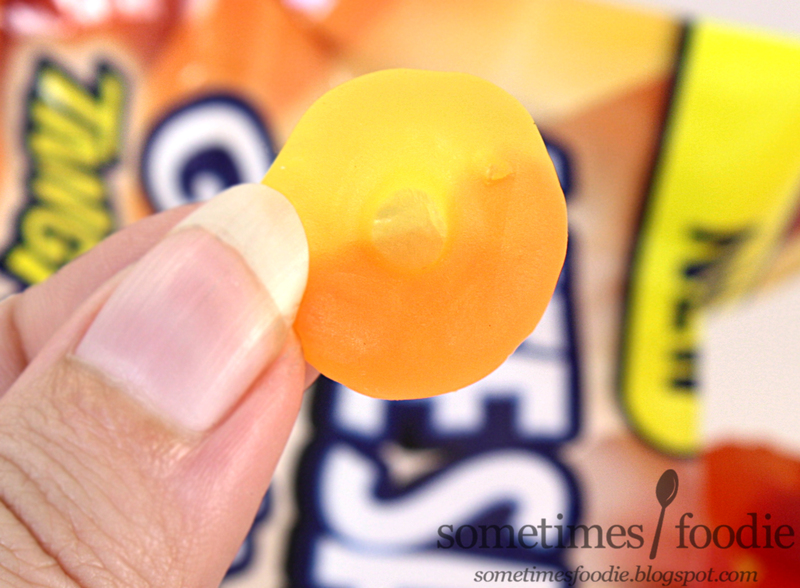 The Orange side is nice and zesty, it really has a lovely sweet but authentic orange flavor. So far so good. Combined, neither flavor overpowers the other, and the resulting combination reminds me of some kind of breakfast juice blend. It's slightly tangy, in the way that orange juice is tangy, but not overly so. 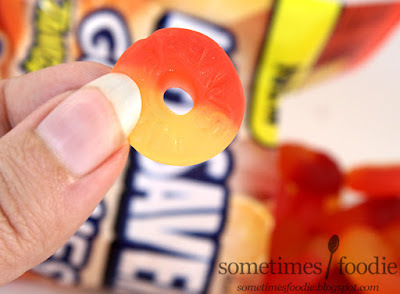 I really liked these individual flavors more apart, and I tend to just bite these rings in half instead of eating them together, because each flavor is just so good. Strawberry & Lemonade - Lastly, we have the typical go-to sweet and tangy combination of strawberry lemonade. The strawberry side is very sweet and surprisingly authentic. It's still not as authentically strawberry as my beloved Kasugai gummies, but as far as American gummy candy goes, this is pretty darn good! The lemonade portion has a delicious citrus zest to it, like the orange. I almost feel like the lemon gummy is more dry than juicy due to it's zestiness, and it isn't all that tangy. Combined, this is another duo that isn't all that tangy, but it tastes really great. The sweetness from the strawberry side mixes beautifully with the zesty lemonade portion, and the flavoring is pretty much the same as any decent strawberry lemonade you can buy at the grocery store. I kind of switched things up as I ate these ones, biting some in half, and eating others whole, so I didn't have an eating preference for this one. I'm really impressed with the individual flavors and their fruity authenticity. They do not taste 100% like actual fruits, but I never expected them to. Still, this is pretty darn close! Especially for a big American company. 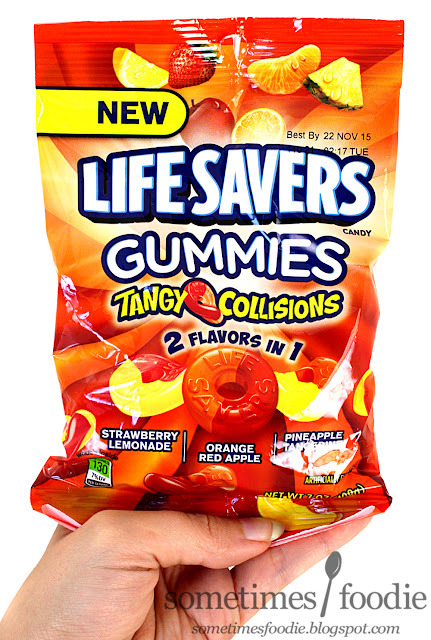 For the record, the candies don't live up to their tangy name, at least I don't feel like they do, but the flavors and combinations taste great, so I would definitely buy these again. 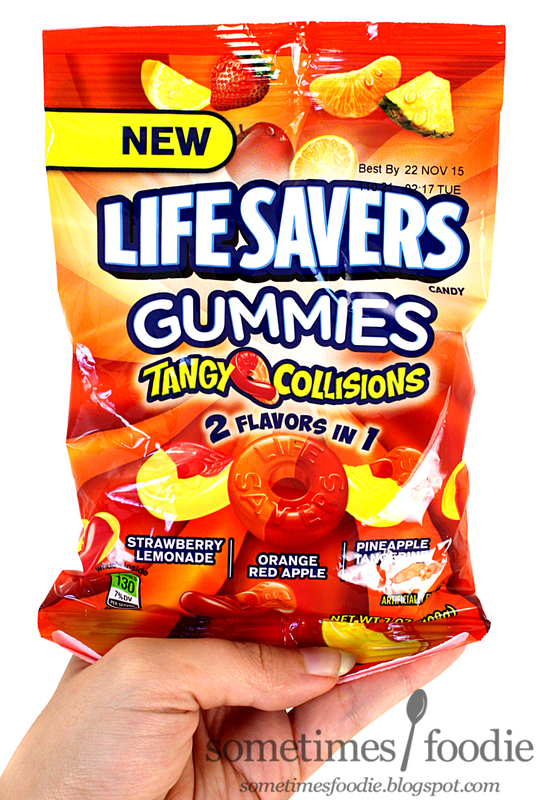 These fruity combinations are fun and refreshing for summer, so if you're a gummy fan (like me) I'd say these are definitely worth buying. I can't imagine anyone feeling disappointed by this mix. Nice! That'll be fun to review next year!